The V-Fin kit is a new release from Smok featuring a TFV12 Big Baby Prince Tank and an inbuilt battery with a capacity of 8000mAh. No wonder the size of the V-fin kit is quite bulky. Nevertheless, you will never regret your choice because with this kit, you get prolonged vaping thanks to the high-rated battery and on top of that, it comes with a large tank which means the instances where you have to refill are minimized a great deal. The mod itself measures 85mm tall and 56mm wide with a 31.5mm depth. It comes in five different colors which include; white with a rainbow flash, classic black with red flash, black with a purple flash, and silver with a black flash and black with rainbow flash. One of the best features of the Smok V-Fin kit is the OLED HD screen. It helps to display the relevant info including the mode, current power, battery life, voltage, resistance, current, puff counter and temperature among others. It also features a large sidebar firing button and a USB port for charging the mod. Instead of a spring loaded thread, the Smok V-Fin kit uses a non-reinforced pin which works well with the 510 thread although this combination may have some issues with some particular tanks. 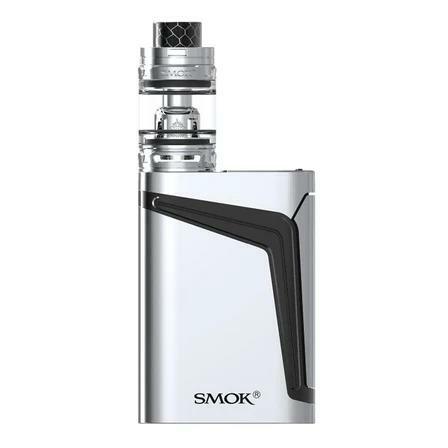 Smok V-Fin Kit has a long lasting and powerful battery. It produces fresh flavor and huge vapor. It has been designed on modern ways of technology. I love this product. Its performance and design are great. It produces good flavor and vapor. Battery also lasts long. Wow, the 8000mAh battery has got all the power and lasts very long. Quality is very high. Price is very reasonable. This product performs so smoothly. It makes huge clouds and produces the best flavor. I am very impressed by the performance of this vape kit. It well worth the money. Highly recommended. This is the ideal vape for me. It matches my vaping style. It works smoothly. Price is very good. I am really amazed by the battery life of this vape kit. It is powerful and lasts for days. It is a very innovative device. Beast coils and battery perform very well. Shipping was super fast. Great customer service by Haze Smoke Shop. Bought it a few days ago online from Haze Smoke Shop. Battery timing is excellent. Performance is good. Quality is great. I love the quality of coil and battery life of this product. Tank has amazing quality and sufficient capacity. Definitely recommended. Its perfect solution for a person looking for an all rounder vaping device. Battery life is great. Charges quickly.